Rostami, S., Pasdar, A., Gerayli, S., Hatami, H., Sepahi, S., Nategh, F., Meshkat, M., Hoseini, S., Ahadi, M., Sima, H., Vosughinia, H., Sarvghad, M., Esmaeelzade, A., Nomani, H., Mosanan Mozafari, H., Rezai Talab, F., Shakeri, M., Meshkat, Z. (2017). Comparison of Interferon-Gamma (IFNG) +874 T/A Single Nucleotide Polymorphism in Hepatitis C Virus Infected Patients and Non-Infected Controls in Mashhad, Iran. Iranian Journal of Pathology, 12(3), 248-256. Sina Rostami; Alireza Pasdar; Sina Gerayli; Hamed Hatami; Samaneh Sepahi; Fatemeh Nategh; Mojtaba Meshkat; Seyed Mousalreza Hoseini; Mitra Ahadi; Hamid Reza Sima; Hasan Vosughinia; Mohammad Reza Sarvghad; Abbas Esmaeelzade; Hosein Nomani; Homan Mosanan Mozafari; Fariba Rezai Talab; Mohammad Taghi Shakeri; Zahra Meshkat. "Comparison of Interferon-Gamma (IFNG) +874 T/A Single Nucleotide Polymorphism in Hepatitis C Virus Infected Patients and Non-Infected Controls in Mashhad, Iran". 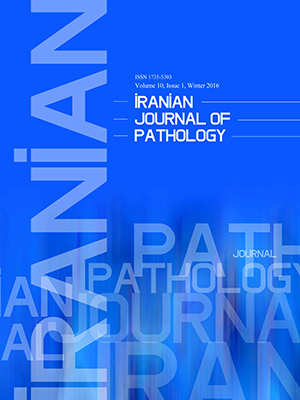 Iranian Journal of Pathology, 12, 3, 2017, 248-256. Rostami, S., Pasdar, A., Gerayli, S., Hatami, H., Sepahi, S., Nategh, F., Meshkat, M., Hoseini, S., Ahadi, M., Sima, H., Vosughinia, H., Sarvghad, M., Esmaeelzade, A., Nomani, H., Mosanan Mozafari, H., Rezai Talab, F., Shakeri, M., Meshkat, Z. (2017). 'Comparison of Interferon-Gamma (IFNG) +874 T/A Single Nucleotide Polymorphism in Hepatitis C Virus Infected Patients and Non-Infected Controls in Mashhad, Iran', Iranian Journal of Pathology, 12(3), pp. 248-256. Rostami, S., Pasdar, A., Gerayli, S., Hatami, H., Sepahi, S., Nategh, F., Meshkat, M., Hoseini, S., Ahadi, M., Sima, H., Vosughinia, H., Sarvghad, M., Esmaeelzade, A., Nomani, H., Mosanan Mozafari, H., Rezai Talab, F., Shakeri, M., Meshkat, Z. Comparison of Interferon-Gamma (IFNG) +874 T/A Single Nucleotide Polymorphism in Hepatitis C Virus Infected Patients and Non-Infected Controls in Mashhad, Iran. Iranian Journal of Pathology, 2017; 12(3): 248-256. Background and Objectives: Interferon-gamma is an important cytokine, which facilitates immunity against intracellular pathogens. Several factors, including genetic variations of cytokine-producing genes have been shown to influence the progression and severity of Hepatitis C virus (HCV) infection. Methods: Between January and December 2012, 87 HCV-infected individuals and 89 individuals without HCV infection were recruited for the study of Single Nucleotide Polymorphism (SNP) at Interferon Gamma (IFNG) +874 T/A. After extraction of genomic DNA from Peripheral Blood Mononuclear Cells (PBMCs) in blood sample of the individuals, Amplification Refractory Mutation System (ARMS) polymerase chain reaction was performed to evaluate the SNP at this position. Results: The frequency of genotype TA was 62.1% in the HCV-infected group, while it was 47.2% for the control group (p=0.033). However, after adjusting for confounders (including alcohol consumption, drug addiction, transfusion, and tattoos), the genotypes at this position did not show any statistically significant association with HCV infection (adjusted P values were above 0.05). The frequency of allele A was slightly higher in patients than the controls (55.2% versus 48.3%).Carriers of A allele were more frequent in patients with HCV infection compared to the control group (55.17% in patients versus 48.31% in the control group; P=0.02). However, after adjustment for confounders, the results were no longer statistically significant (P=0.2). Conclusion: A carrier status for certain alleles and genotypes at Interferon Gamma (IFNG) +874 T/A may lead to higher susceptibility to HCV infection in a certain population. 1. Lavanchy D. Evolving epidemiology of hepatitis C virus. Clinical Microbiology and Infection. 2011;17(2):107-15. 2. Hajarizadeh B, Grebely J, Dore GJ. Epidemiology and natural history of HCV infection. Nat Rev Gastroenterol Hepatol. 2013 09//print;10(9):553-62. 3.Kolls JK, Szabo G. The genetics of hepatitis C virus underlie its ability to escape humoral immunity. Journal of Clinical Investigation. 2015;125(1):97. 4. Brenndörfer ED, Sällberg M. Hepatitis C virus-mediated modulation of cellular immunity. Archivum immunologiae et therapiae experimentalis. 2012;60(5):315-29. 5. Koziel MJ, editor Cytokines in viral hepatitis2008: © 1999 by Thieme Medical Publishers, Inc.
6. Hold GL, Untiveros P, Saunders KA, El-Omar EM. Fibrogenesis & Tissue Repair. 2009;2(6). 7. Awad MR, El-Gamel A, Hasleton P, Turner DM, Sinnott PJ, Hutchinson IV. Genotypic variation in the transforming growth factor-[beta] 1 gene: association with transforming growth factor-[beta] 1 production, fibrotic lung disease, and graft fibrosis after lung transplantation. Transplantation. 1998;66(8):1014-20. 8. Fishman D, Faulds G, Jeffery R, Mohamed-Ali V, Yudkin JS, Humphries S, et al. The effect of novel polymorphisms in the interleukin-6 (IL-6) gene on IL-6 transcription and plasma IL-6 levels, and an association with systemic-onset juvenile chronic arthritis. Journal of Clinical Investigation. 1998;102(7):1369-76. 9. Sun Y, Lu Y, Li T, Xie L, Deng Y, Li S, et al. Interferon Gamma+ 874T/A Polymorphism Increases the Risk of Hepatitis Virus-Related Diseases: Evidence from a Meta-Analysis. PloS one. 2015;10(5):e0121168. 10. Castelli JC, Hassel BA, Wood KA, Li X-L, Amemiya K, Dalakas MC, et al. A study of the interferon antiviral mechanism: apoptosis activation by the 2–5A system. The Journal of experimental medicine. 1997;186(6):967-72. 11. Goodbourn S, Didcock L, Randall R. Interferons: cell signalling, immune modulation, antiviral response and virus countermeasures. Journal of General Virology. 2000;81(10):2341-64. 12. Huang Y, Chen XC, Konduri M, Fomina N, Lu J, Jin L, et al. Mechanistic link between the anti‐HCV effect of interferon gamma and control of viral replication by a ras‐MAPK signaling cascade. Hepatology. 2006;43(1):81-90. 13. Carlo-Stella N, Badulli C, De Silvestri A, Bazzichi L, Martinetti M, Lorusso L, et al. A first study of cytokine genomic polymorphisms in CFS: Positive association of TNF-857 and IFNgamma 874 rare alleles. Clinical and experimental rheumatology. 2006;24(2):179-82. 14. Lalor PF, Shields P, Grant AJ, Adams DH. Recruitment of lymphocytes to the human liver. Immunology and cell biology. 2002;80(1):52-64. 15. Pravica V, Perrey C, Stevens A, Lee JH, Hutchinson IV. A single nucleotide polymorphism in the first intron of the human IFN-γ gene:: Absolute correlation with a polymorphic CA microsatellite marker of high IFN-γ production. Human immunology. 2000;61(9):863-6. 16. Makhatadze NJ. Tumor necrosis factor locus: genetic organisation and biological implications. Human immunology. 1998;59(9):571-9. 17. Smith A, Humphries SE. Cytokine and cytokine receptor gene polymorphisms and their functionality. Cytokine & growth factor reviews. 2009;20(1):43-59. 18. Frese M, Schwärzle V, Barth K, Krieger N, Lohmann V, Mihm S, et al. Interferon‐γ inhibits replication of subgenomic and genomic hepatitis C virus RNAs. Hepatology. 2002;35(3):694-703. 19.Lanford RE, Guerra B, Lee H, Averett DR, Pfeiffer B, Chavez D, et al. Antiviral effect and virus-host interactions in response to alpha interferon, gamma interferon, poly (i)-poly (c), tumor necrosis factor alpha, and ribavirin in hepatitis C virus subgenomic replicons. Journal of virology. 2003;77(2):1092-104. 20.Napoli J, Bishop G, McCaughan G. Increased intrahepatic messenger RNA expression of interleukins 2, 6, and 8 in human cirrhosis. Gastroenterology. 1994;107(3):789-98. 21.Bonilla N, Barget N, Andrieu M, Roulot D, Letoumelin P, Grando V, et al. Interferon gamma‐secreting HCV‐specific CD8+ T cells in the liver of patients with chronic C hepatitis: relation to liver fibrosis–ANRS HC EP07 study*. Journal of viral hepatitis. 2006;13(7):474-81. 22. Afshari R, Nomani H, Zaniani FR, Nabavinia MS, Mirbagheri Z, Meshkat M, et al. Genotype distribution of hepatitis C virus in Khorasan Razavi Province, Iran. Turkish Journal of Medical Sciences. 2014;44(4):656-60. 23.Ohno O, Mizokami M, Wu R, Saleh M, Ohba K, E O, et al. New hepatitis C virus (HCV) genotyping system that allows for identification of HCV genotypes 1a, 1b, 2a, 2b, 3a, 3b, 4, 5a, and 6a. J Clin Microbiol. 1997;35:201-7. 24. Shakeri MT, Nomani H, Mobarhan MG, Sima HR, Gerayli S, Shahbazi S, et al. The prevalence of hepatitis C virus in mashhad, iran: a population-based study. Hepatitis Monthly. 2013;13(3). 25. Afshari R, Nomani H, Zaniani FR, Nabavinia MS, Mirbagheri Z, Meshkat M, et al. Genotype distribution of hepatitis C virus in Khorasan Razavi Province, Iran. Turkish Journal of Medical Sciences. 2014;44. 26.Wang X-H, Netski DM, Astemborski J, Mehta SH, Torbenson MS, Thomas DL, et al. Progression of fibrosis during chronic hepatitis C is associated with rapid virus evolution. Journal of virology. 2007;81(12):6513-22. 27. Hu SX, Kyulo NL, Xia VW, Hillebrand DJ, Hu K-Q. Factors associated with hepatic fibrosis in patients with chronic hepatitis C: a retrospective study of a large cohort of US patients. Journal of clinical gastroenterology. 2009;43(8):758-64. 28.Hoffmann SC, Stanley EM, Cox ED, DiMercurio BS, Koziol DE, Harlan DM, et al. Ethnicity greatly influences cytokine gene polymorphism distribution. American Journal of Transplantation. 2002;2(6):560-7. 29. Lloyd AR, Jagger E, Post JJ, Crooks L-A, Rawlinson WD, Hahn YS, et al. Host and viral factors in the immunopathogenesis of primary hepatitis C virus infection. Immunology and cell biology. 2007;85(1):24-32. 30. Lechmann M, Woitas RP, Langhans B, Kaiser R, Ihlenfeldt HG, Jung G, et al. Decreased frequency of HCV core-specific peripheral blood mononuclear cells with type 1 cytokine secretion in chronic hepatitis C. Journal of hepatology. 1999;31(6):971-8. 31. Perrey C, Pravica V, Sinnott PJ, Hutchinson IV. Genotyping for polymorphisms in interferon-γ, interleukin-10, transforming growth factor-β1 and tumour necrosis factor-α genes: a technical report. Transplant Immunology. 1998;6(3):193-7. 32. Albuquerque MCd, Aleixo ALQdC, Benchimol EI, Leandro ACCS, Neves LBd, Vicente RT, et al. The IFN-³+ 874T/A gene polymorphism is associated with retinochoroiditis toxoplasmosis susceptibility. Memórias do Instituto Oswaldo Cruz. 2009;104(3):451-5. 33.Karaoglan I, Pehlivan S, Namiduru M, Pehlivan M, Kilinçarslan C, Balkan Y, et al. TNF-alpha, TGF-beta, IL-10, IL-6 and IFN-gamma gene polymorphisms as risk factors for brucellosis. New Microbiol. 2009;32(2):173-8. 34.Tso H, Ip W, Chong W, Tam C, Chiang A, Lau Y. Association of interferon gamma and interleukin 10 genes with tuberculosis in Hong Kong Chinese. Genes and Immunity. 2005;6(4):358-63. 35.Kerr J, McCoy M, Burke B, Mattey D, Pravica V, Hutchinson I. Cytokine gene polymorphisms associated with symptomatic parvovirus B19 infection. Journal of clinical pathology. 2003;56(10):725-7. 36.Cheong JY, Cho SW, Chung SG, Lee JA, Yeo M, Wang HJ, et al. Genetic polymorphism of interferon-γ, interferon-γ receptor, and interferon regulatory factor-1 genes in patients with hepatitis B virus infection. Biochemical genetics. 2006;44(5-6):246-55. 37. Karatayli S, Ulger Z, Ergul A, Keskin O, Karatayli E, Albayrak R, et al. Tumour necrosis factor‐alpha, interleukin‐10, interferon‐gamma and vitamin D receptor gene polymorphisms in patients with chronic hepatitis delta. Journal of viral hepatitis. 2014;21(4):297-304. 38.Gao Q-J, Liu D-W, Zhang S-Y, Jia M, Wang L-M, Wu L-H, et al. Polymorphisms of some cytokines and chronic hepatitis B and C virus infection. World journal of gastroenterology: WJG. 2009;15(44):5610-9. 39.Dai C-Y, Chuang W-L, Chang W-Y, Chen S-C, Lee L-P, Hsieh M-Y, et al. Polymorphisms in the interferon-γ gene at position+ 874 in patients with chronic hepatitis C treated with high-dose interferon-α and ribavirin. Antiviral research. 2005;67(2):93-7. 40.Sarvari J, Norozian H, Fattahi MR, Pirbonyeh N, Moattari A. The Role of Interferon Gamma Gene Polymorphism (+ 874A/T,+ 2109A/G, and-183G/T) in Response to Treatment Among Hepatitis C Infected Patients in Fars Province, Southern Iran. Hepatitis Monthly. 2014;14(1). 41.Dai C-Y, Chuang W-L, Hsieh M-Y, Lee L-P, Hou N-J, Chen S-C, et al. Polymorphism of interferon–gamma gene at position+ 874 and clinical characteristics of chronic hepatitis C. Translational Research. 2006;148(3):128-33. 42.Ben-Ari Z, Pappo O, Druzd T, Sulkes J, Klein T, Samra Z, et al. Role of cytokine gene polymorphism and hepatic transforming growth factor β1 expression in recurrent hepatitis C after liver transplantation. Cytokine. 2004;27(1):7-14. 43. Bouzgarrou N, Hassen E, Farhat K, Bahri O, Gabbouj S, Maamouri N, et al. Combined analysis of interferon-γ and interleukin-10 gene polymorphisms and chronic hepatitis C severity. Human immunology. 2009;70(4):230-6. 44. Huang Y, Yang H, Borg BB, Su X, Rhodes SL, Yang K, et al. A functional SNP of interferon-γ gene is important for interferon-α-induced and spontaneous recovery from hepatitis C virus infection. Proceedings of the National Academy of Sciences. 2007;104(3):985-90. 45. Frodsham AJ, Zhang L, Dumpis U, Taib NAM, Best S, Durham A, et al. Class II cytokine receptor gene cluster is a major locus for hepatitis B persistence. Proceedings of the National Academy of Sciences. 2006;103(24):9148-53.